Now I am sure you are reading this thinking, “Really? A dark spot? No big deal.” That was what I thought too, until I got one right above my upper lip. At first I wasn’t too worried about it, but then I noticed it getting darker. Anyone I asked said it looked fine and that they didn’t even notice it. But I did... No matter how good I might have looked, all I could see was the dark spot. I didn’t so much mind the fact that I had a dark spot as much as I minded the placement of it. Darkness right above your upper lip tends to look a lot like a mustache, even when there isn’t a single hair visible. For a woman, that isn’t a super fun feeling. I like to think I am a pretty confident girl, but this silly little “blemish” was really bringing me down. I would try to talk myself into being okay with it and not letting it get to me, but the more I tried to do that, the more it seemed to bug me. Finally I decided to take action. Simply covering it up with makeup wasn’t fixing the problem... I would like to say that this is the part that I overcome my insecurity and decide to “rock my dark spot”, however, that just isn’t the reality. I started buying nearly every cream I could get my hands on to lighten and remove the spot. Now I know that this is a blog all about self-worth and being confident in your own skin, but it is just as much, or even more a blog about being REAL. I am a real person with real insecurities just like everyone else. While I am still a firm believer that true beauty comes from within, I honestly believe that there is something to be said about taking care of our bodies on the outside that helps us feel pretty on the inside. 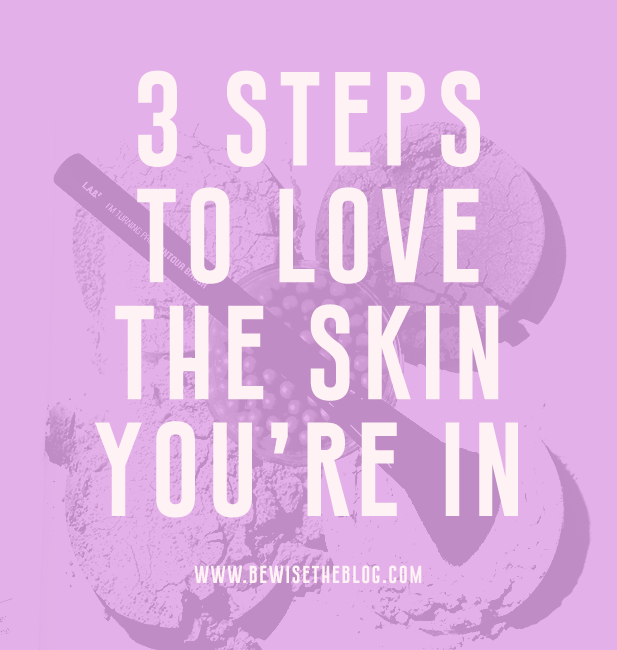 Here are three ways that I have learned to love the skin I’m in that will hopefully help you learn to love yours as well. I would constantly look at girls who were more tan than I was and wish that I had what they had. Instead of taking care of my own skin, I was doing all I could to make it look different. Maybe you don’t have the "pale skin complex" like I do, maybe you are comparing for different reasons. Whatever the reason, the first step to loving your own skin requires that you stop comparing. I know this is a lot easier said than done, but it’s super important. The second you notice yourself falling into the comparison trap, don’t allow yourself to entertain those thoughts. Your mind is a powerful tool. Train it to turn those thoughts off. I had to learn the hard way that wanting something I didn’t have would eventually lead to me getting something I never wanted. That tan that I spent years seeking after left its mark on me, and it wasn’t a very pretty one. I wish so badly I could go back in time and teach little Ceciley that tanning wasn’t worth it. I wish I could tell her that taking care of her skin was the best way to learn to love her skin. Now I am much more aware of how important it is to protect and take care of my skin. Through this I have found I love my skin so much more now than I did when it was tan. I still have my moments where I long for that sun kissed look, but I am learning to love the skin that I am in. Instead of trying to drastically change my appearance or skin color through makeup or other products, I now strive to find products that compliment or enhance what I already have. Instead of using all kinds of tanning lotions and oils, I am slathering on the sunscreen. Especially on my face. I want to make sure I am protecting what I have instead of changing what I have. I now look for products that will benefit my skin not the skin I wish I had and it has made such a huge difference. Learning to love what we have and not comparing or wishing we had something else can be super difficult. If you need to step off the comparison train, do it today. If you need to start caring for the skin you have instead of wishing you had something different, do it today. If you need to start using products that protect and enhance your already beautiful features, do it today. You are beautiful, and you deserve to feel beautiful. Start feeling it today. Check the blog tomorrow to find out what products I now use that have helped me learn to love MY own skin. How have you learned to love the skin you’re in?